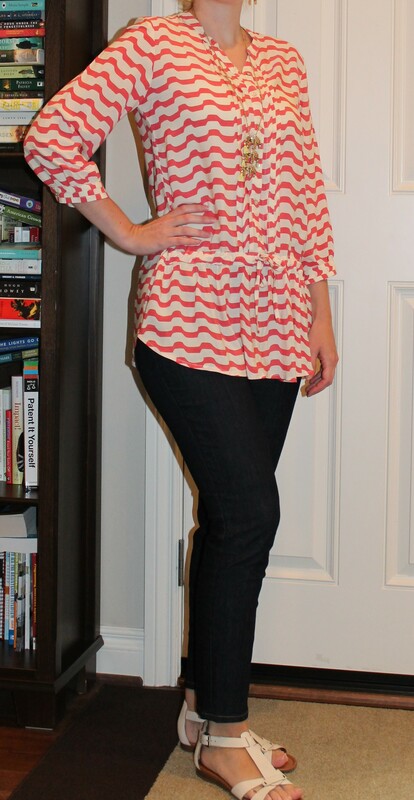 Another style I’m fond of for disguising my pear shape is a tunic top paired with skinny jeans. I got this one at Anthropologie and love the pattern and fabric. There clothing is somewhat on the pricier side, but I try to find thing I truly love there and therefore can justify the price. I once bought a pair of $80 lounge pants there which seems ridiculous, but they are my favorite pants in my closet. I paired them with a simple white tee and a layered necklace for a summer concert. I’m sure they’ll be one of my go-to items in hot weather.